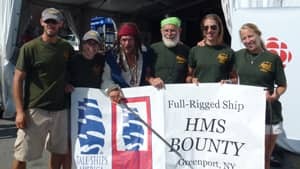 Det är nu bekräftat av US coastguards att HMS Bounty har sjunkit idag utanför Cape Hatteras när kapten och 16 crewmembers försökte segla runt ”Frankenstormen” Sandy. Två personer saknas fortfarande och det är troligen kaptenen och hans dotter. Two crew members of a Nova Scotia-built replica vessel are missing after abandoning ship off the coast of North Carolina in high seas brought on by Hurricane Sandy. Officials with the U.S. Coast Guard told CBC News the 16-member crew of HMS Bounty decided to abandon ship after getting caught in 5.5-metre seas off Cape Hatteras on Monday. Coast Guard officials said the two missing crew members — a man and a woman — are believed to be in cold water survival suits and life-jackets. He said the air search is being plotted based on wind direction and speed, and will be expanded. Claudia McCann, whose husband Robin Walbridge is the captain of the Bounty, told CBC News her husband is one of the two missing crew members. CBC News has learned the other missing crew member is Claudene Christian. HMS Bounty sank several hours after the evacuation. Crew members of HMS Bounty pose during the Tall Ships Festival in Halifax in July. (CBC)”We had a C-130 on scene that was running out of fuel and experiencing a little crew fatigue, so we dispatched another C-130 to arrive on scene and relieve them,” said Petty Officer 1st Class Jordan Campbell. The Hercules C-130 remains on the scene in the search for the missing crew members. A third MH-60 Jayhawk helicopter is on the way to assist in the search effort, said the U.S. Coast Guard. McCann told CBC News she hadn’t slept since she received word the ship was taking on water. She said her husband, Captain Robin Walbridge, was trying to get around Hurricane Sandy en route to Florida. ”He was just trying to avoid it, skirt it. Skirt through it, skirt around it,” McCann said earlier on Monday. Claudene Christian, whose daughter — also named Claudene Christian — is a crew member on the Bounty, said her daughter had contacted her before heading out on her journey. ”She says, ’We’re heading out and I just wanted to tell you and dad that I love you.’ And I said, ’What are you saying that for?’ And she said, ’Just in case something happens,'” Christian said in a phone interview from Oklahoma. The replica of HMS Bounty, which launched in Lunenburg in 1960, was made famous in a 1962 movie starring Marlon Brando — Mutiny on the Bounty. It has also appeared in Pirates of the Caribbean: Dead Man’s Chest starring Johnny Depp. HMS Bounty operated as a sea school and was most recently in Halifax in July for the Tall Ships Festival.